At this stage of the voyage, it would be altogether natural for one’s focus to gravitate towards the finish line. After all, it has been 173 days since we departed our home port of Rock Hall, MD last October. In the past six months, we have visited 19 islands including each of the six islands that collectively comprise the French West Indies. One might believe that repetitive arrivals and departures and the novelty of discovering volcanic islands that jut abruptly out of the sea may have become passé at this juncture. Yet during the past ten days, Martinique has cast its spell upon us. What makes this island so compelling? For starters, there are sufficient cultural and language differences to impart the feeling of being in a very foreign place. 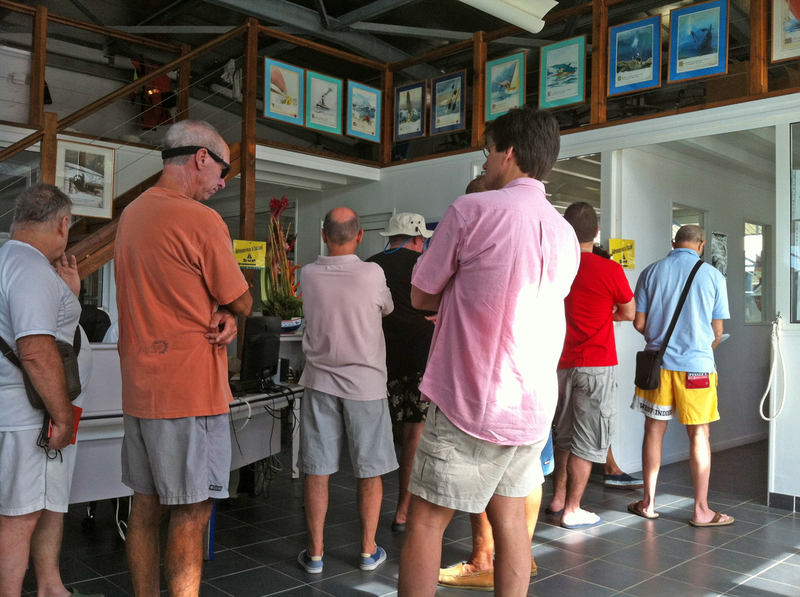 The combination of small seaside villages, a vibrant metropolitan capital city, a major yachting center and protected anchorages all contribute to making Martinique a highly rated cruising experience. After six days of exploring the Fort de France area, including Anse Mitan and Trois Islets, Cutter Loose is finally underway again. A short distance south of Fort de France, the small village of Grande Anse de Arlet beckons as an overnight destination. 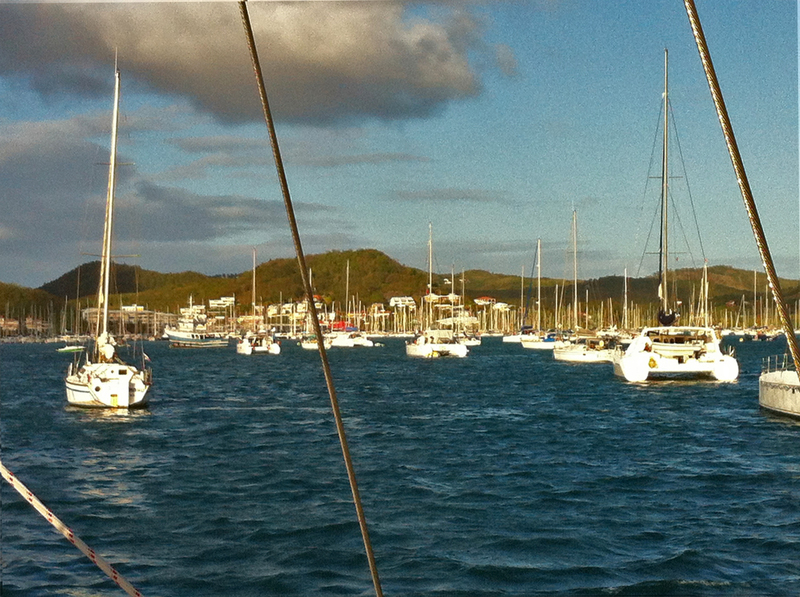 To our surprise, the harbor is filled with free moorings for transients. Obviously, this community is hospitable to cruising sailors. Since the mooring balls lack a pennant, the foredeck hand (aka Pat) is now lying prone on the deck, stretching to thread a bow line through the ring at the top of the ball. These contortions attract attention in the harbor. Nearby, a female single hander on a French flag vessel observes Pat’s struggle. Within seconds, mademoiselle is in her dinghy and has both of our lines looped through the mooring ring. She is a woman of few words due to the language barrier. Mission accomplished, she offers a quick smile and a welcoming wave before returning rapidly to her boat. Serendipity is one of the most rewarding aspects of cruising. Just the other day, a French skipper steered his vessel within inches of Cutter Loose as we were getting underway with a knot or two of boat speed from our anchorage at Fort de France. Given his facial expression, he was obviously irritated with us about something. Our knee-jerk reaction that day was to negatively stereotype the French. Today, we become the beneficiaries of a random act of French kindness. Cutter Loose is the only U.S. flag vessel in the harbor today. 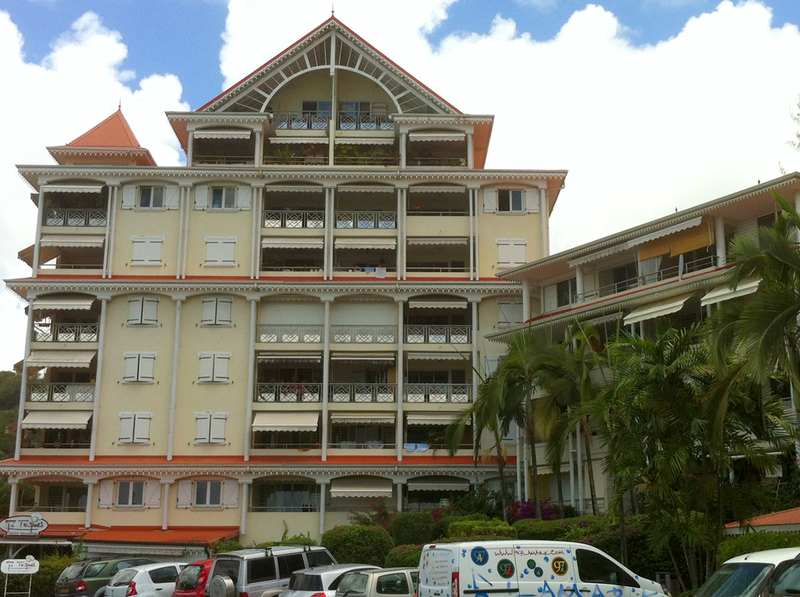 Perhaps our minority status in this area of Martinique has evoked this casual but generous gesture? We must learn not to judge an entire nationality or culture based on the actions of a single insensitive individual. Ashore, Grande Anse de Arlet features an excellent dinghy pier, a beach, a promenade along the water and a dozen restaurants and small shops fronting on the promenade. 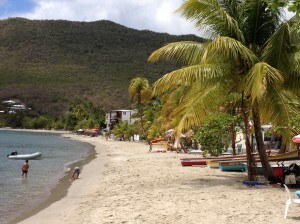 Tourists frequently stop here for lunch and a swim on the beach during their rental car tour of Martinique. 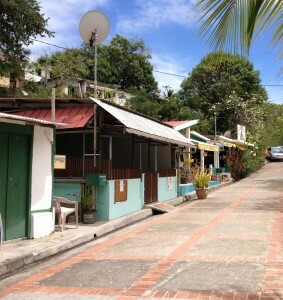 From the waterfront, it is a short walk to the trailhead for Morne Champagne. 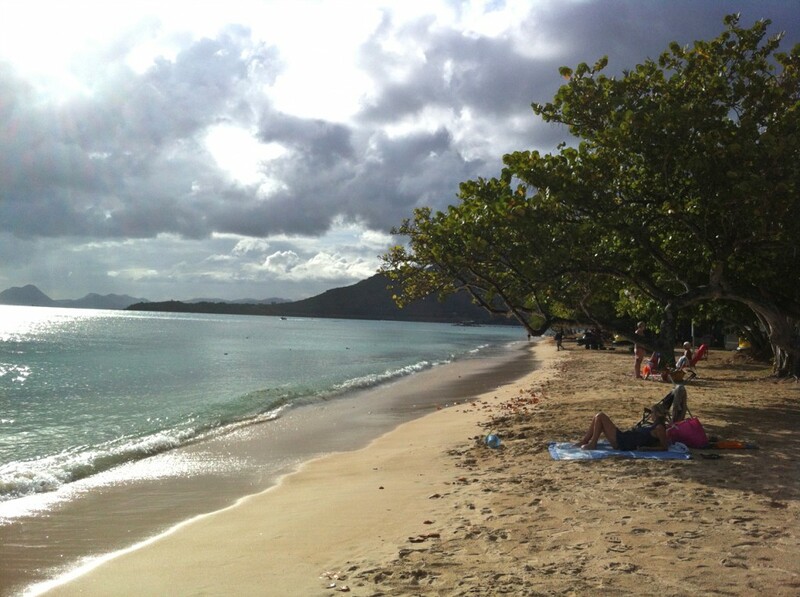 Our objective is an afternoon hike to the neighboring village of Anse de Arlet, a few miles to the south. Two hours later, we are still climbing uphill through a natural drainage swale. Obviously, we have taken a wrong turn inasmuch as our destination is nowhere in sight. After an about face to the familiar territory of Grande Anse de Arlet, we pause for a beverage at a beachfront café before returning to Cutter Loose. 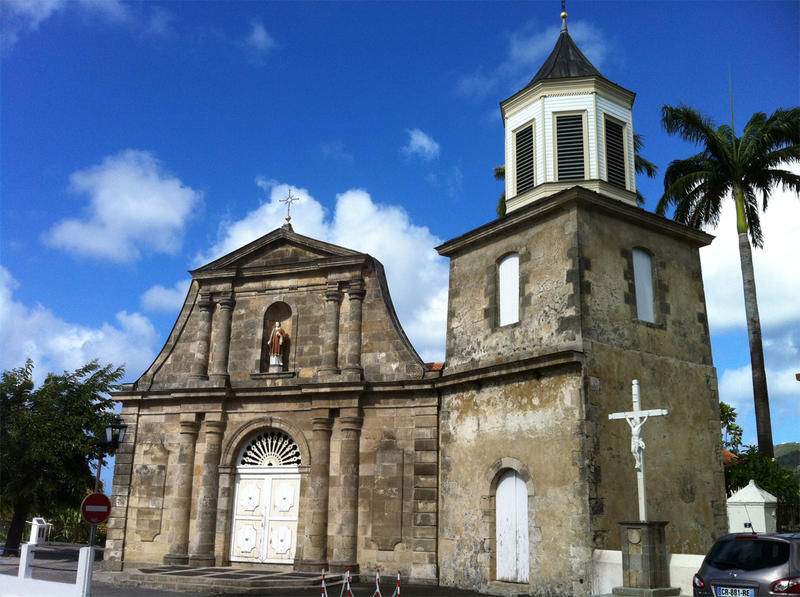 On Thursday morning, we are underway for our 13 mile journey to the village of Sainte Anne on the south coast of Martinique. 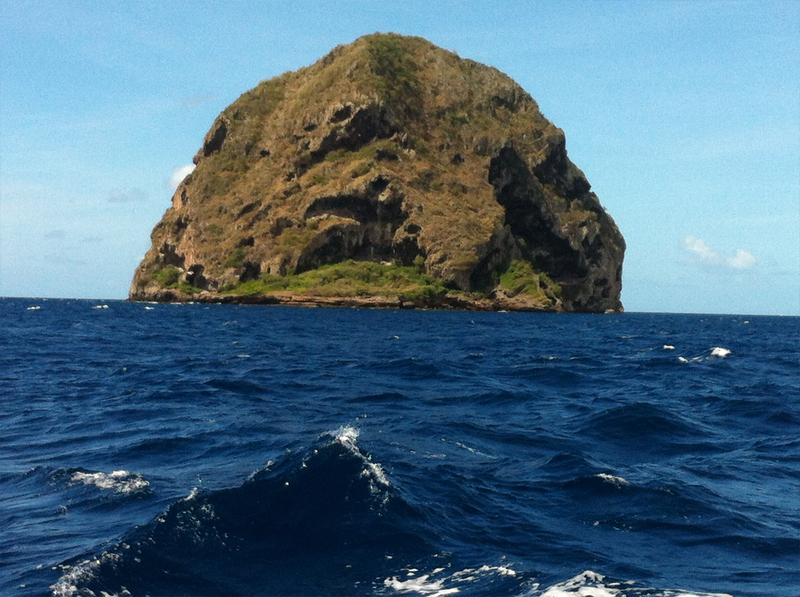 Diamond Rock, a gigantic volcanic protrusion from the water, marks our turn to the east. In the early 1800s, British forces established a fort on the promontory of Diamond Rock from which they harassed French ships bound for Fort de France. To this day, the Royal Navy still considers “HMS Diamond Rock” as being in commission. When passing, HM ships are required to show due respect, meaning that personnel on the upper deck are required to stand at attention and face the rock while the bridge salutes. From Diamond Rock, the final nine miles to Sainte Anne is directly into the prevailing wind. The harbor here offers crystal clear water and protection from the easterlies, which afford swimming opportunities as well as calm nights at anchor. 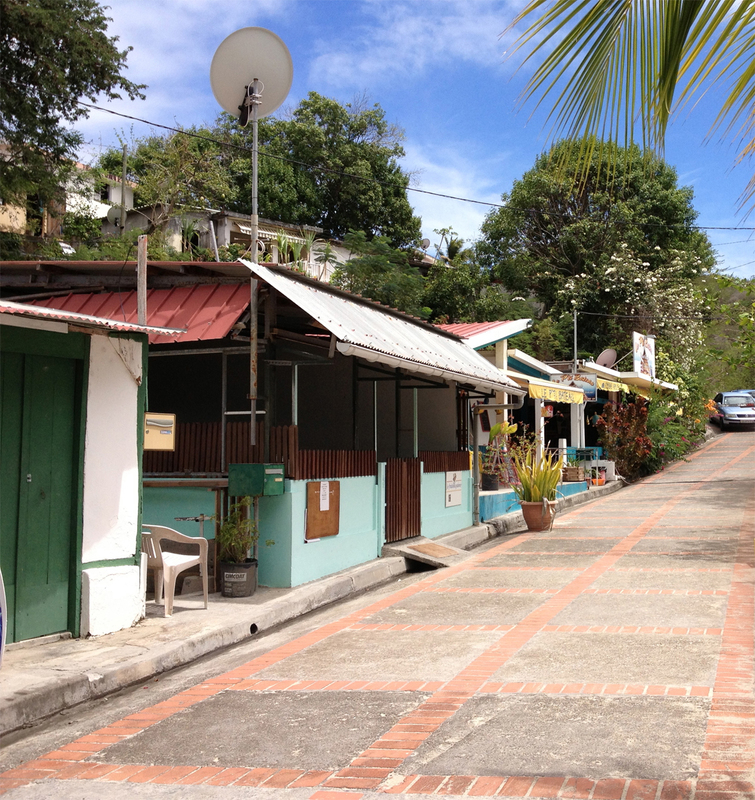 The small village of Sainte Anne is a tourist destination with several patisseries and clothing shops. Adjacent to the town pier are bars and restaurants that front on the water. Late in the afternoon, these establishments become filled with patrons who come here to witness an outstanding view of the sun setting over Diamond Rock. It is a short walk from the town pier past the colorful cemeterie to the beach north of the village. The beach is an entertainment district unto itself, offering a variety of restaurants and watersports facilities. The highly manicured Club Med Buccaneer Creek facility with its light green colored roofs is located just beyond the town beach. 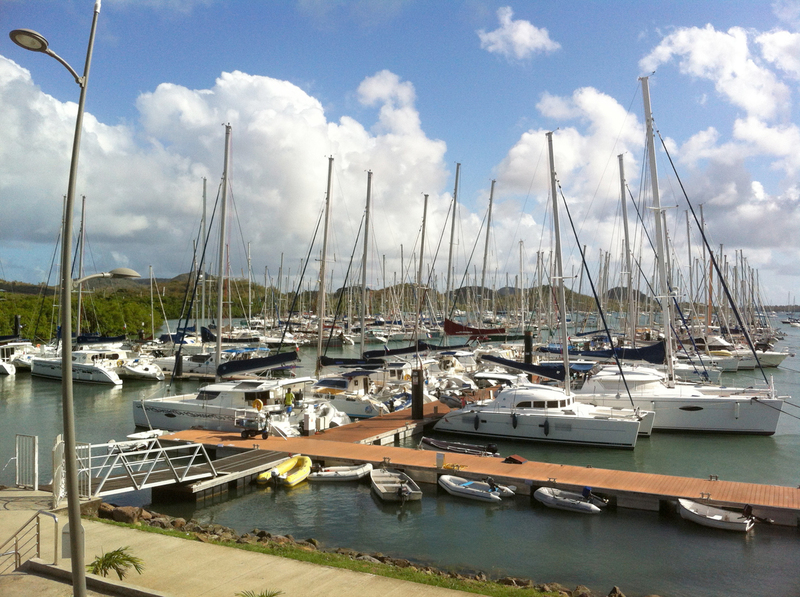 Cruising sailors come here to relax and enjoy the slow pace of the village and its amenities. On Saturday, Cutter Loose is underway once again to the nearby town of Marin. The well-marked entrance to the Cul-de-Sac du Marin is strewn with shoals and reefs. Waves break constantly on the shallow reefs on either side of the entrance channel. Once inside, the harbor is an inland sea of masts. We find an open spot on the north shore to drop the hook. While our anchorage is close to the Leader Price grocery store dinghy dock, it is a 20 minute walk to the marina complex from here. 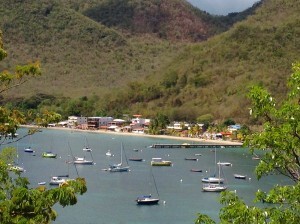 Marin is the Annapolis of Martinique. For French sailors, Marin is holy ground. 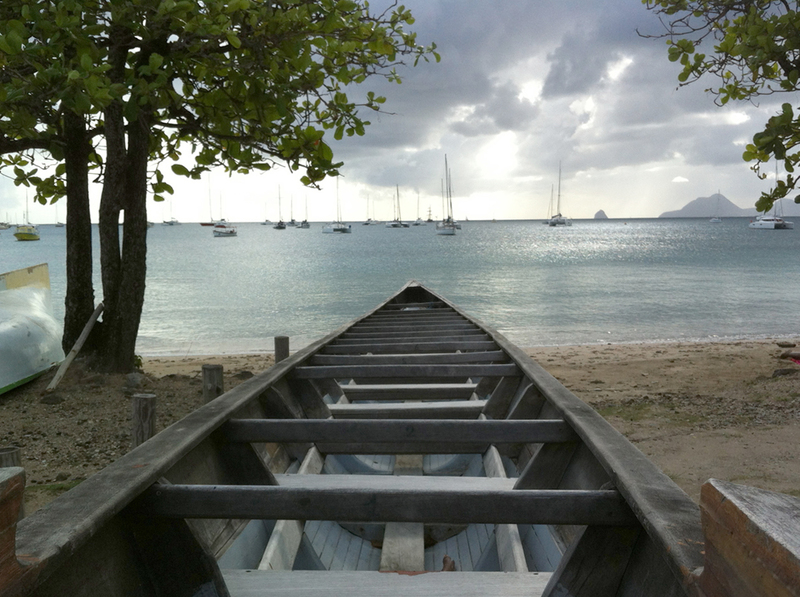 If you live in Martinique and own a sailboat, or if you are a sailor living in France, chances are good that Marin is familiar territory. Marin’s waterfront is home to a dozen charter agencies, yacht brokers, a vast array of marine services and supplies, a 600 slip marina, condos and a variety of eating and drinking establishments. 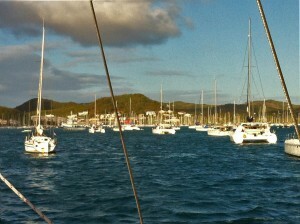 There are another 400 boats at anchor and on moorings. Some of the anchored boats are obviously unoccupied and visited infrequently. On Sunday morning, we hike through town to the office of the Captanerie for the purpose of clearing customs. 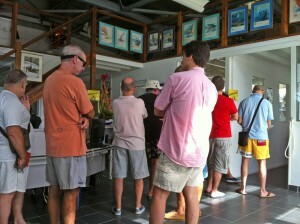 A dozen pale white French skippers are already in line to use the clearance computers. 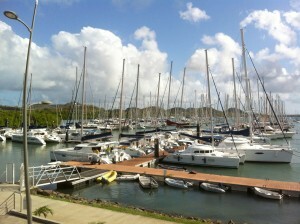 They are recent arrivals in Marin, setting off on a charter vacation to explore the islands to the south of Martinique. After 15 days in Martinique, we will bid a fond farewell to this picturesque and interesting island. 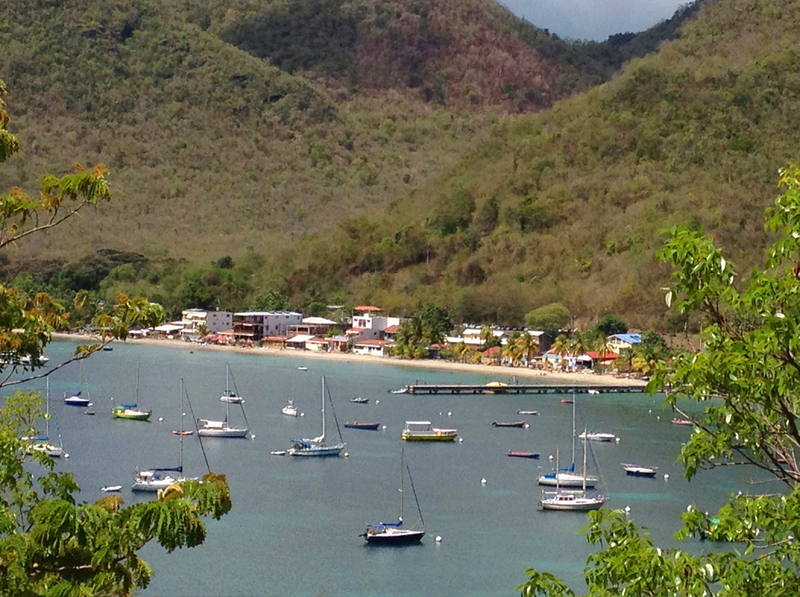 On Monday, we will set sail for Rodney Bay, Saint Lucia.